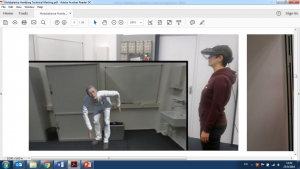 Holobalance introduces a new user experience: the patient who is in need of vestibular rehabilitation can do it at home with the guidance of a balance physiotherapy hologram!!! But why a hologram? Simply because humans see the world in 3D and the currently dominant interaction with computers and smartphones is too 2D and pretty non-natural. The hologram which has the form of a virtual physio, projected in the middle of the room can show in a much more natural and understandable way the balance physiotherapy exercises, enhancing the possibility the patient will perform them correctly, daily, at home (see Figure 1). Motivation and compliance which are the main issues for home based interventions, are expected to be boosted by this approach since the virtual physio will continuously support the patient be adherent with the personalized programme and perform the exercises in the best possible way given her/his abilities and constraints that will be taken into consideration by the platform. Safety, which is the other big issue when doing vestibular rehabilitation at home, is ensured by evaluating human motion through wearable sensors and notifying the patient about the correct performance of exercises. 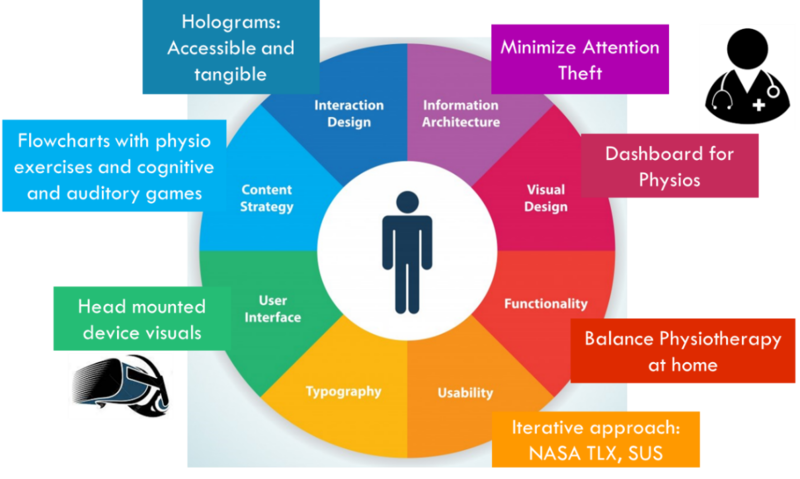 Back to user experience, Figure 2 depicts the main principles adopted in Holobalance for a user-centric approach an optimal experience. The hologram will be visualized through a head mounted device either using a smartphone or a computer as a processing unit. Minimizing attention theft is very important especially given the dizziness that most of the end users experience because of their condition. Evaluating iteratively the experience through validated scales (System Usability Scale, NASA TLX, User Experience Questionnaire) will guarantee the outcome. Providing a dashboard through which the physios can efficiently plan the rehabilitation for each patient is also crucial and the reason behind several failures of similar systems in the past.